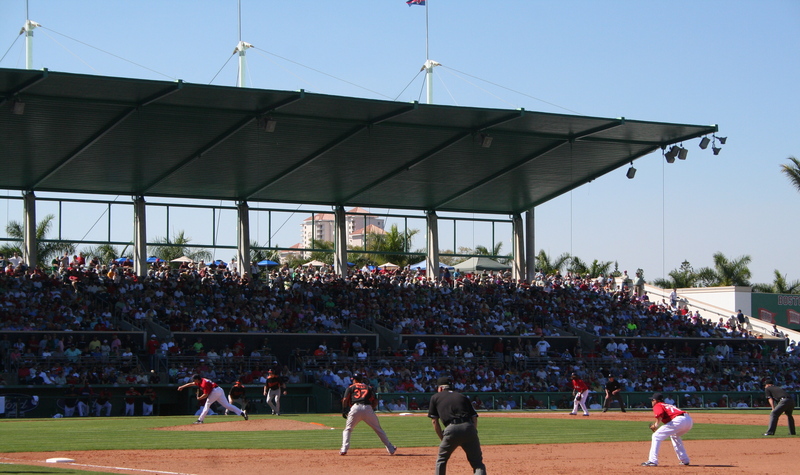 At times, I have referred to baseball as a type of pseudo-reality. But there are certain special moments where it is more of a surreality than anything else. Sometimes my experiences seem unreal to me because they are completely unexpected. 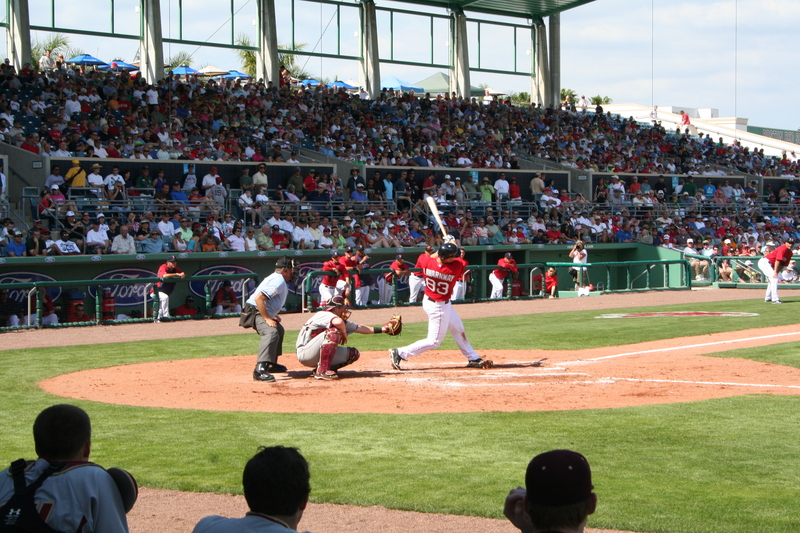 Although I certainly have a memory for certain plays, specific pitching performances, and first major-league hits that I like to bring up when I’m talking with a player; it seems that my fondest memories of the game come from my experiences off the field. The last two times I was at the complex, I took a mental note on where the best places were to stand for picture opportunities (these mental notes were taken while I was standing in what was probably the most inconvenient place possible). 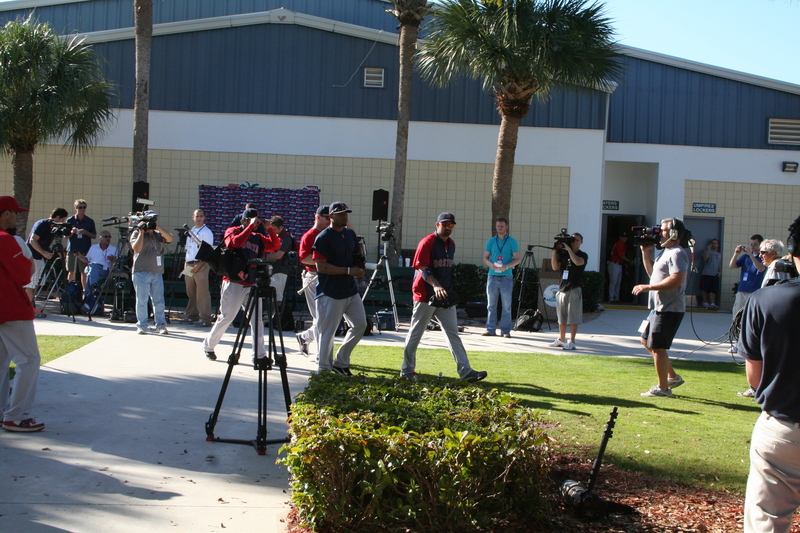 I stationed myself close to where most of the position players walk out to stretch. My observations paid off as I was able to snag what I like to call “good morning pictures” with Nate Spears, Andrew Miller, and Michael Bowden. I will always have a specific affinity towards Michael Bowden because he was my first interview, and that interview really inspired everything I do today. 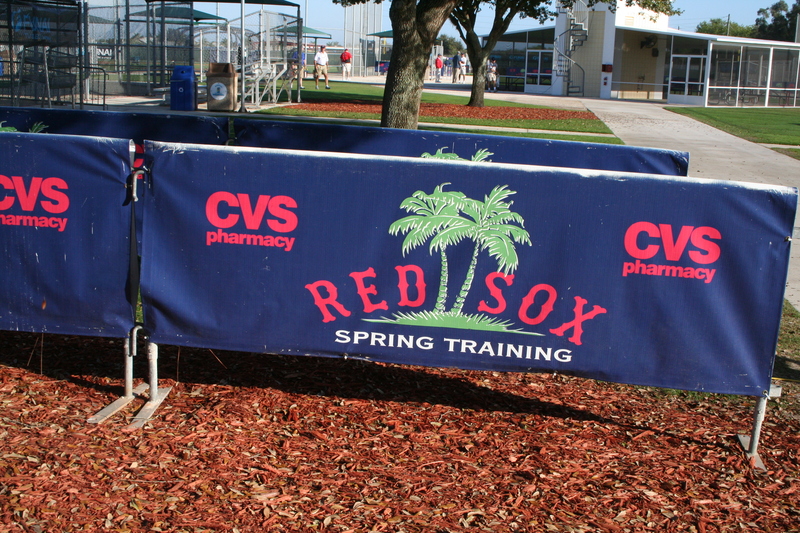 As I was doing my rounds and watching the early morning drills, I was approached by Colin, a camera man for WEEI. 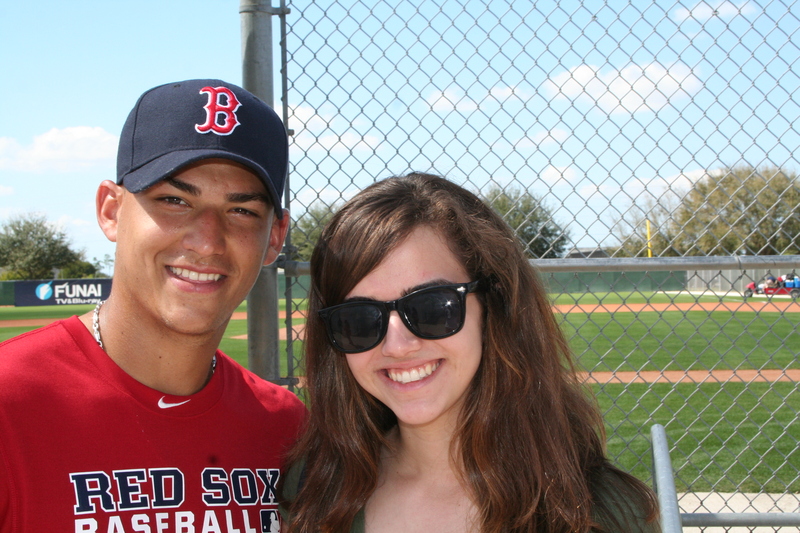 He asked if I wrote a blog about the Red Sox, and the reason why he recognized me is because every time he googles a Red Sox prospect, my blog comes up. 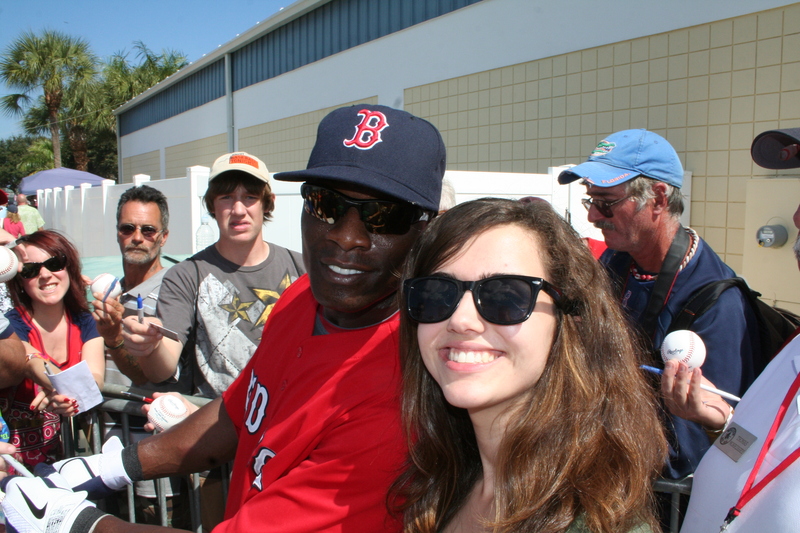 We talked for a bit, and he asked me if I would be interested in doing an interview for WEEI later. It is always a surreal experience to be recognized from my blog or twitter. One of the drills I enjoyed watching the most was the situational run down drills. 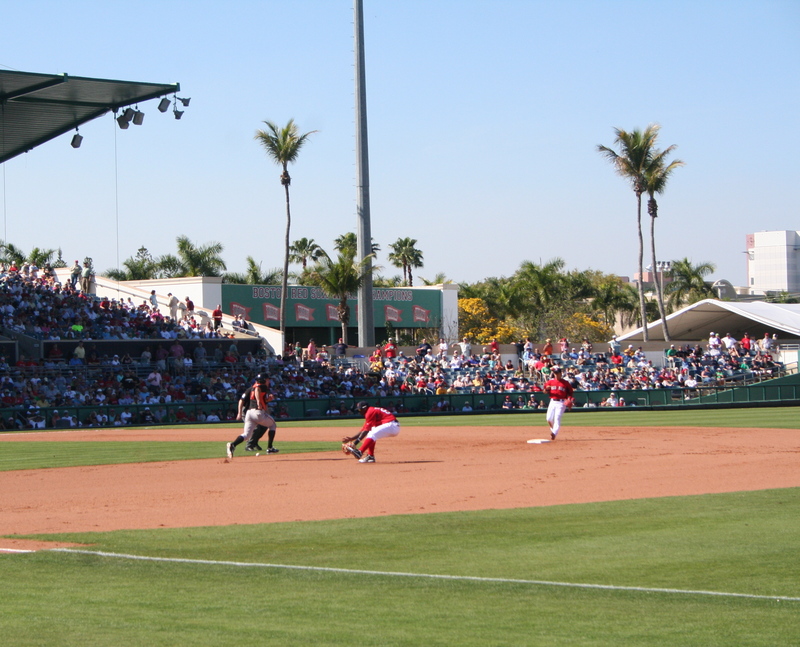 A runner would be placed at one of the bases, and the ball would be hit to a random spot in the infield, and everyone had to adjust accordingly. 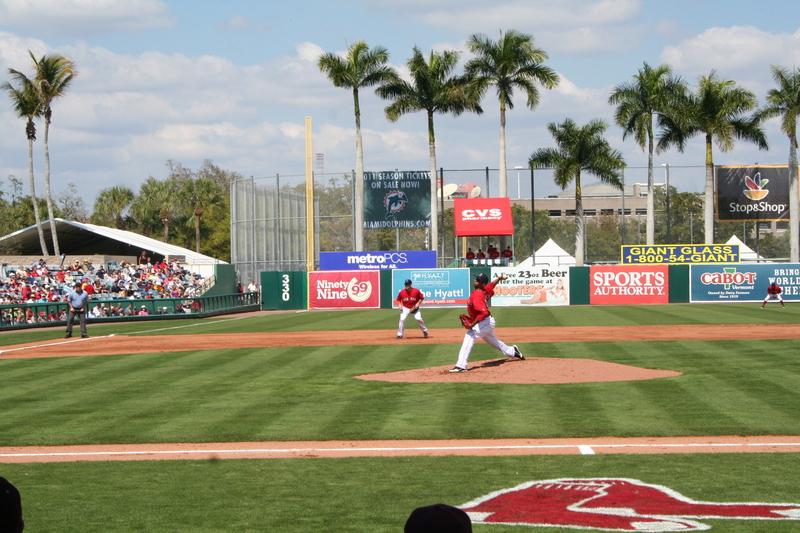 I was happy to see Junichi Tazawa participating after having Tommy John surgery nearly a year ago. 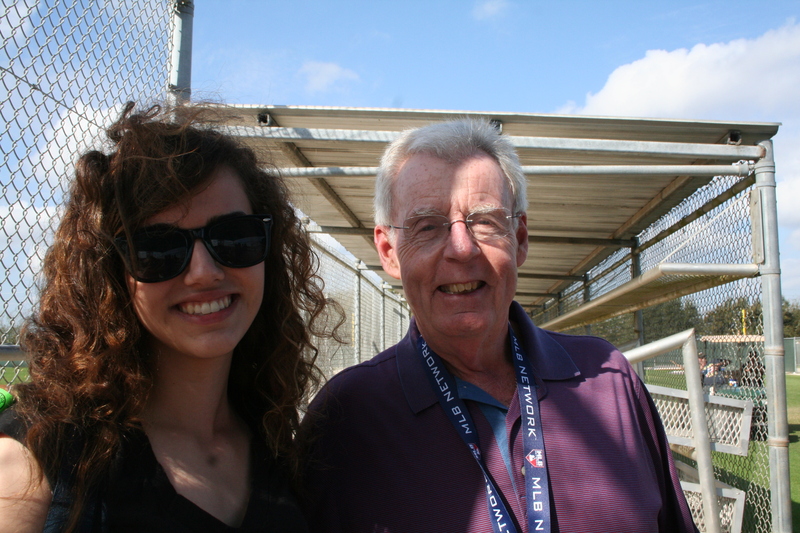 Then, I had the pleasure of meeting and talking to Peter Gammons. 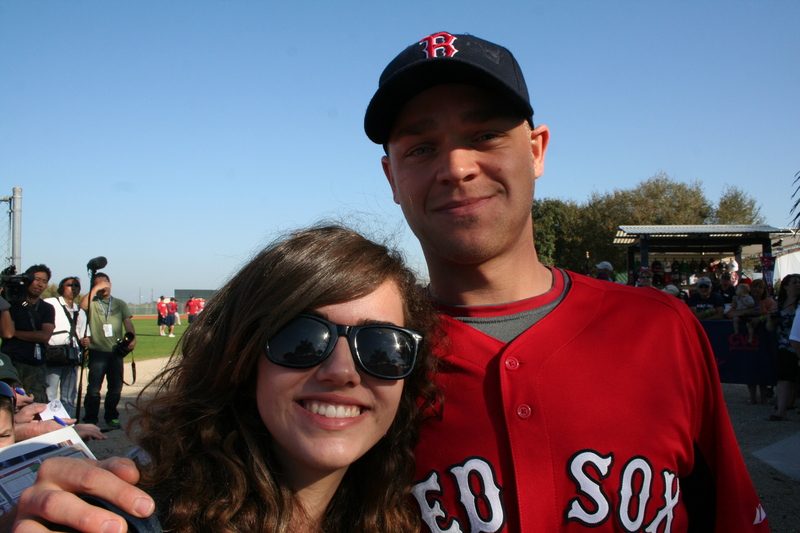 Mr. Gammons follows me on twitter, so I introduced myself as “@redsoxgirl46” before introducing myself as Elizabeth. I actually find it quite amusing that some people recognize me more by my twitter name than my actual name, and I think that this is indicative of the changing times. 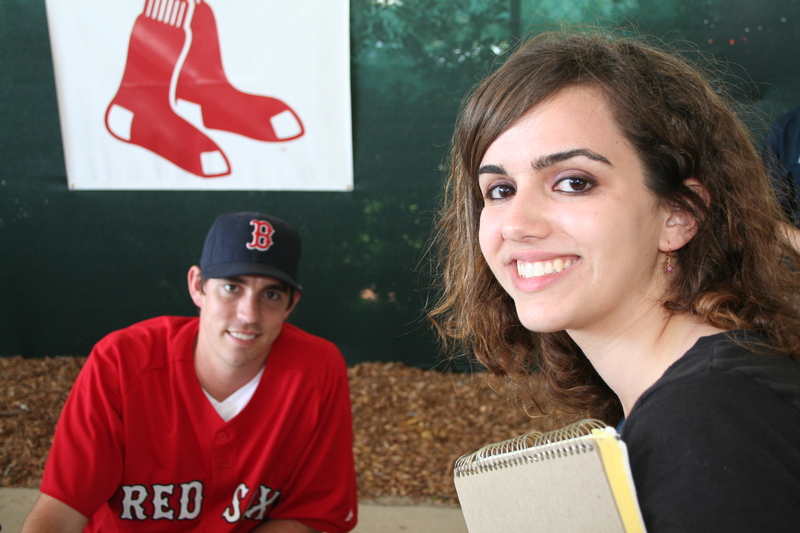 A similar experience happened when I met Mike Antonellis, the radio broadcaster for the Sea Dogs, when I was working in Portland. 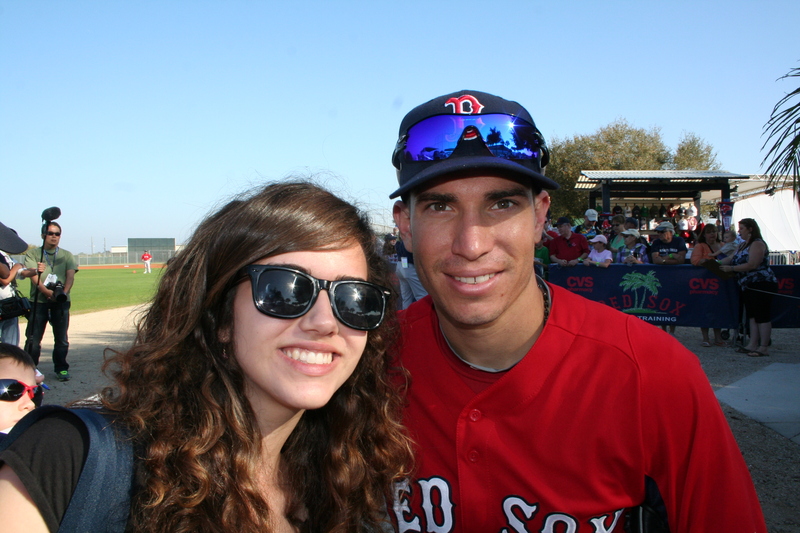 Mr. Cameron introduced me as Elizabeth, which I clarified as “redsoxgirl46 from Twitter,” and Mike was immediately familiar. Mr. Gammons and I actually talked a lot about the changing industry and how everything is moving towards the online medium. We also talked about the importance of networking in this day and age. It was definitely interesting to hear his perspective on this shift because he has been a pioneer in the sports writing industry. I really appreciated his taking the time to talk to me. 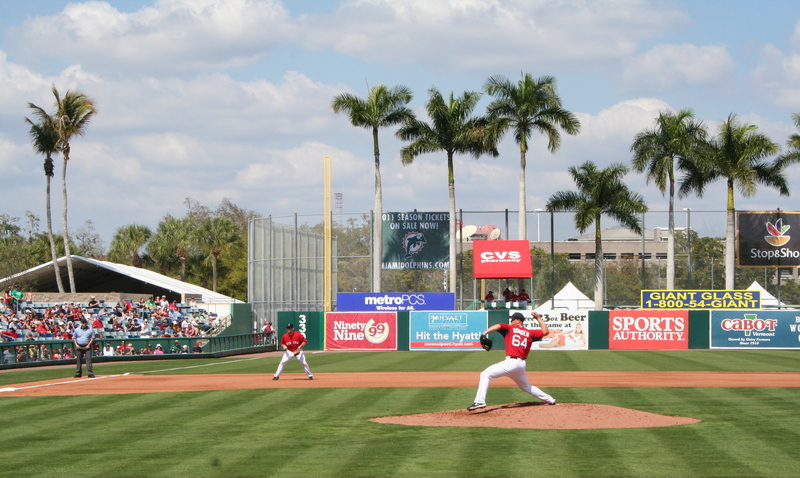 Nearly all of the pitchers went in earlier than usual today (around 10:30), but many of the position players took extended batting practice until nearly 12:30. 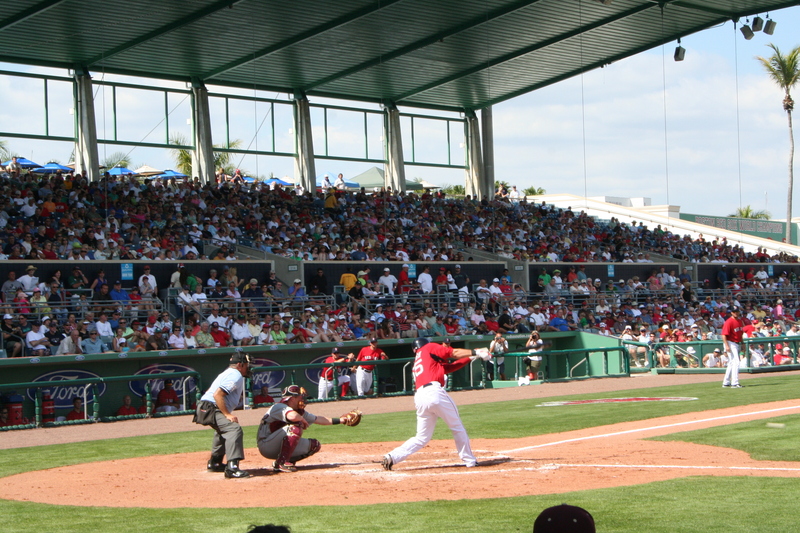 While this was going on, I was interviewed by Robert Bradford of WEEI about what I enjoy about spring training and my blog and its goals. It was kind of surreal being interviewed out of the blue like that, but now that I think about it, I guess that’s how the players feel when I approach them. The interview will be up sometime next week. 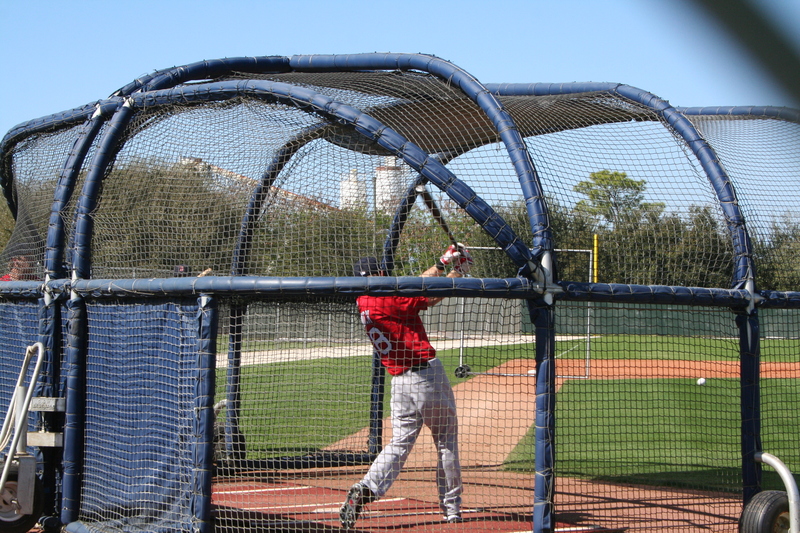 The last batting practice drill of the day was a situational hitting drill, which I had never seen before. Before my interview with Anthony Rizzo this summer, I hadn’t really realized that guys try to hit to certain areas of the ballpark depending on where the runners are. 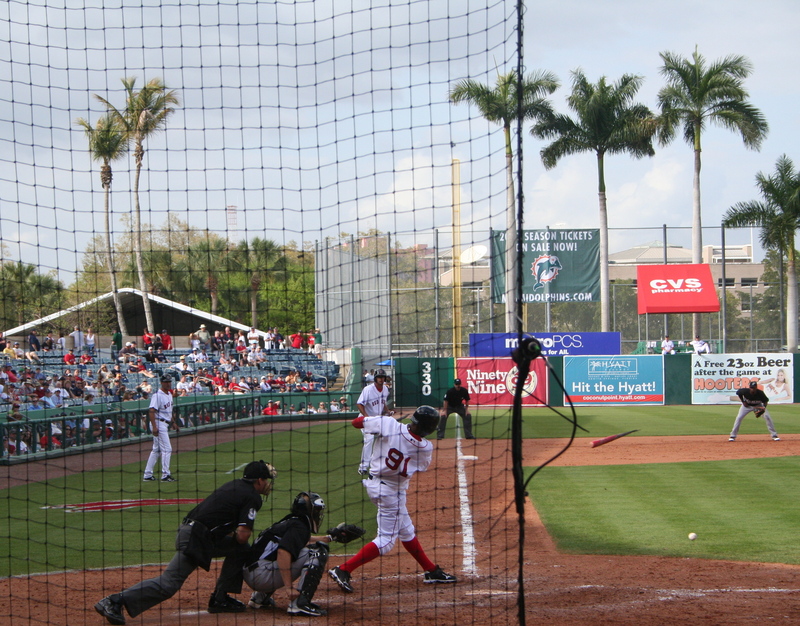 When there was a runner on third, it was incredible for me to see the hitter try to get under the ball a little bit more to induce a sacrifice fly. 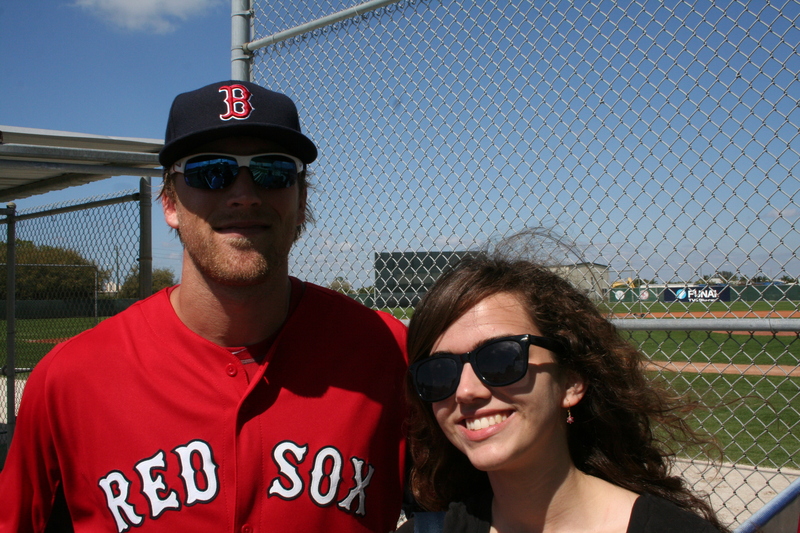 After they finished, Josh Reddick and Lars Anderson were kind enough to stop to take pictures with me. I was able to congratulate Anderson on his first major-league hit, which came on a 94-mph fastball off of Matt Garza. 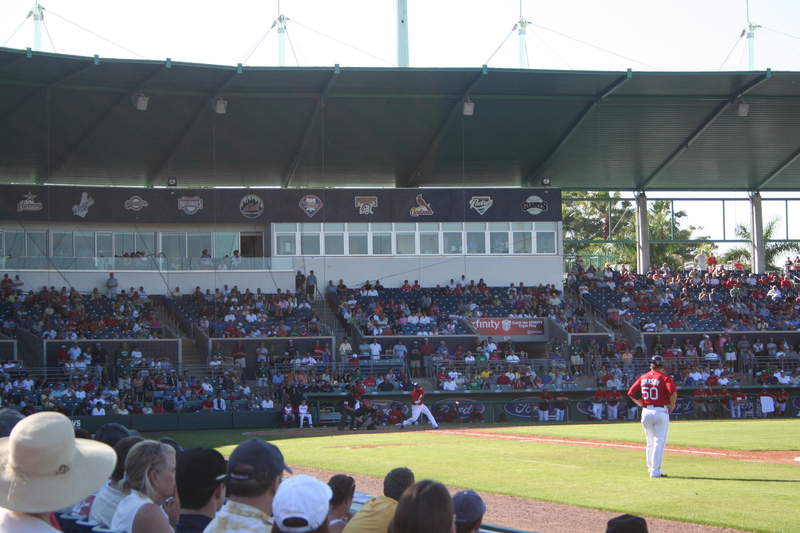 After that, the workout was essentially done, so my dad and I headed back to the stadium for autographs (and by that I mean pictures) with some of the minor league players. We were on the last bus. 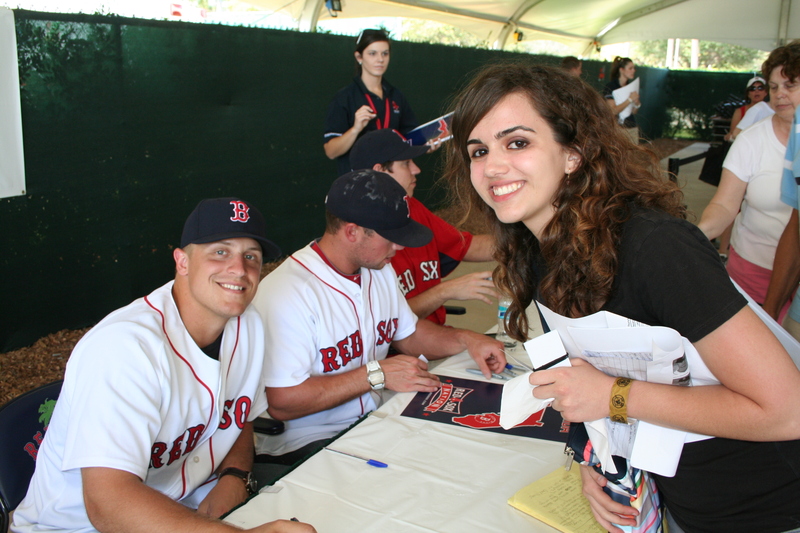 Kyle Weiland, Daniel Nava, Tim Federowciz, Luis Exposito, and Che-Hsuan Lin were signing. 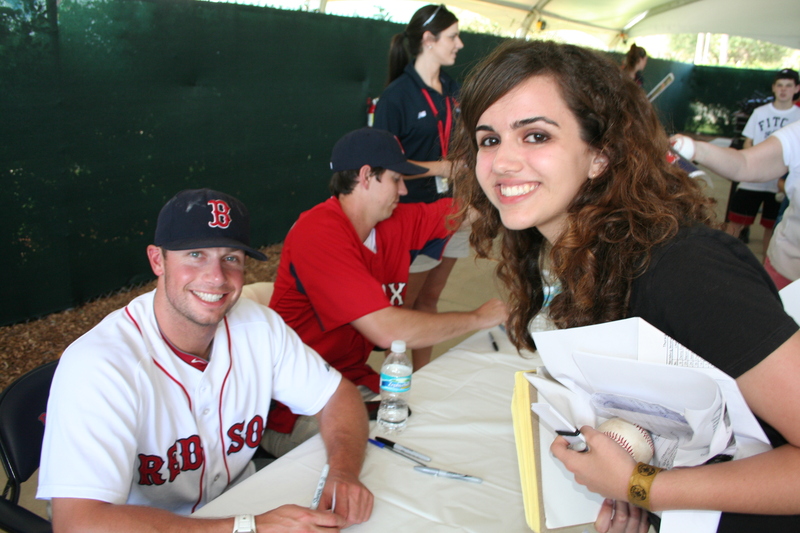 I had some special stuff to show Weiland and Nava. For Weiland, I had my score sheet from the game where he struck out eight batters and retired 20 straight, and for Nava, I had my notes from his Double-A debut. ce, but it was worth the wait. I always assume that players won’t remember me, but there are few things in this world that make me happier when they stop me mid-explanation of who I am, implying that they remember me. 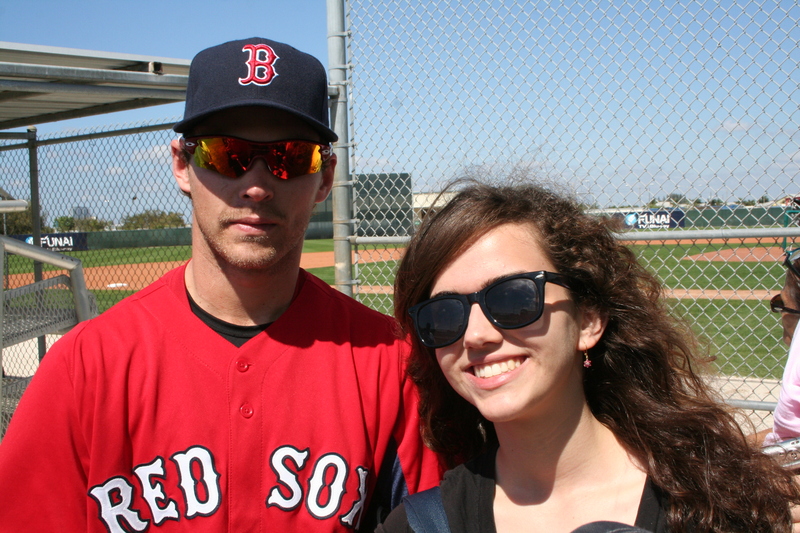 It was great to see Weiland again and just tell him that I was really looking forward to his season. He is working on adding a cutter (or bringing it back from his college days) to his already fabulous arsenal of a fastball, changeup, and slider. I offered him the scorecard for sentimental value, but he said that the Sea Dogs keep books and books of statistics. He said that he really appreciated it though. I could tell that Daniel Nava was really into my game notes once he finally figured out what it was, and read through them a bit. 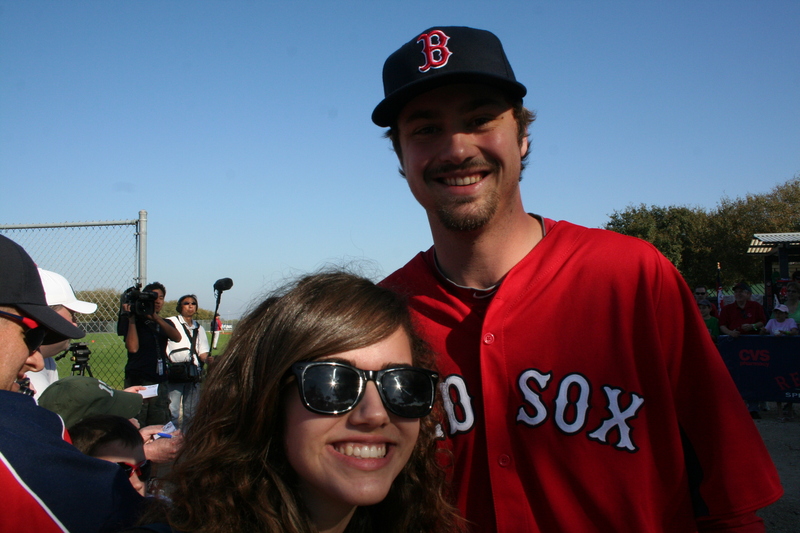 It was great to meet Tim Federowicz, though we didn’t get a chance to chat for long. I asked him how to pronounce his last name for future reference, but I think that will always be a name that I will have my own pronunciation for. It was great to see Luis Expostio again. 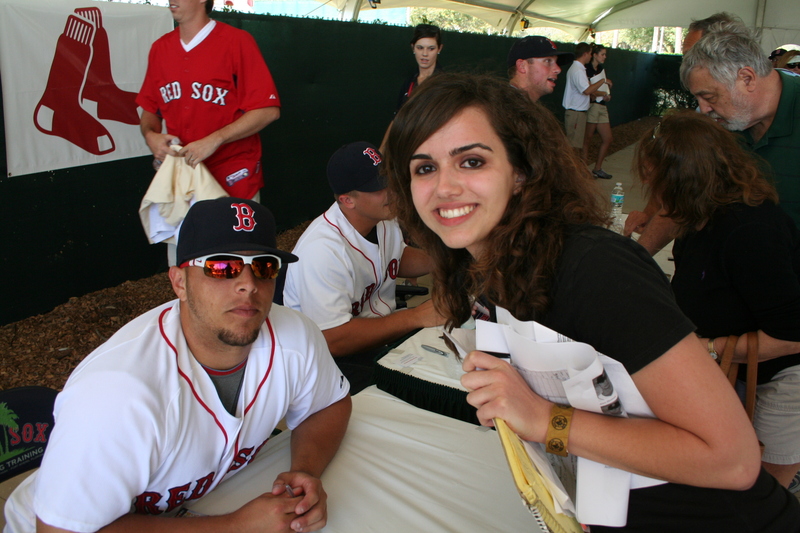 I already have his signature so I just shook his hand. We were being rushed along so I only got to shake Che-Hsuan Lin’s hand, and I proceeded to drop some of my papers all over the place. 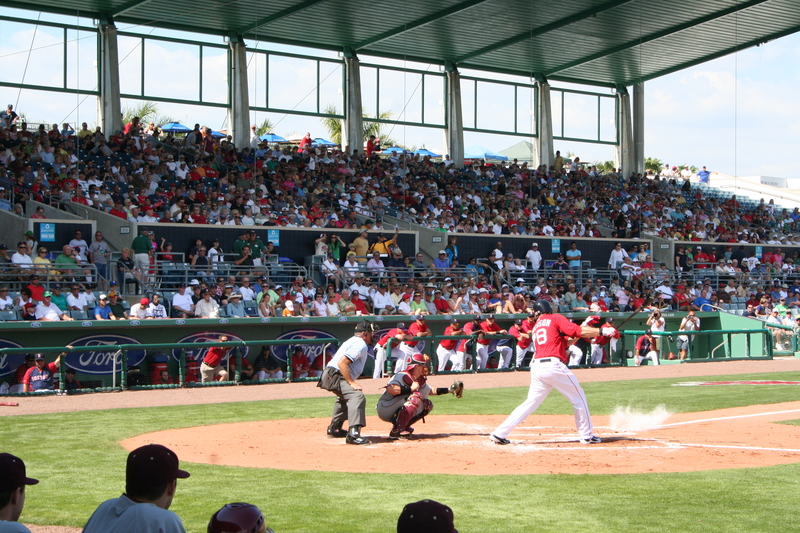 me baseball’s perpetual ability to foster connections and unite people. 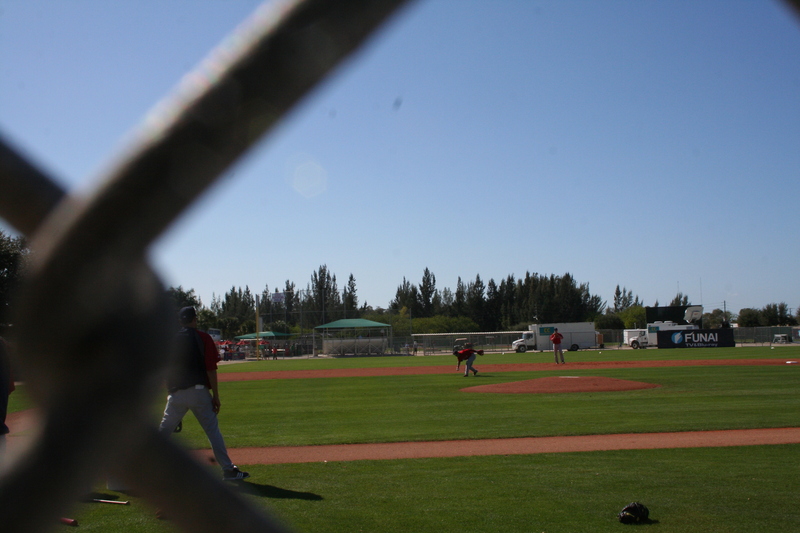 One of the things that I love about spring training is that it always reminds me why I write, and this has been especially important this year with all of the discouraging college news. It has made me realize that I could not care less about their opinions about me. I’ll take Lars Anderson asking “How’s your blog?” or a recognition from Kyle Weiland or a “your blog comes up every time I google a prospect” over a college acceptance letter any day of the week. 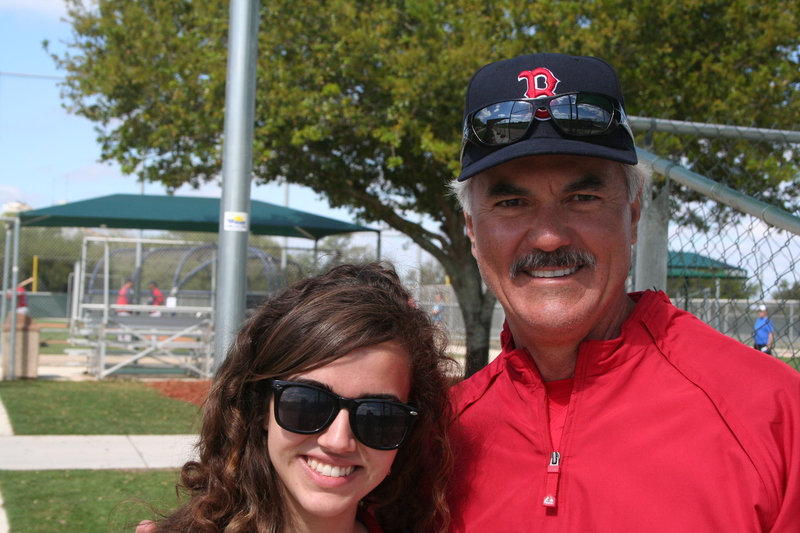 I didn’t start this blog so I could put it on my college application; I started this blog because I love baseball. 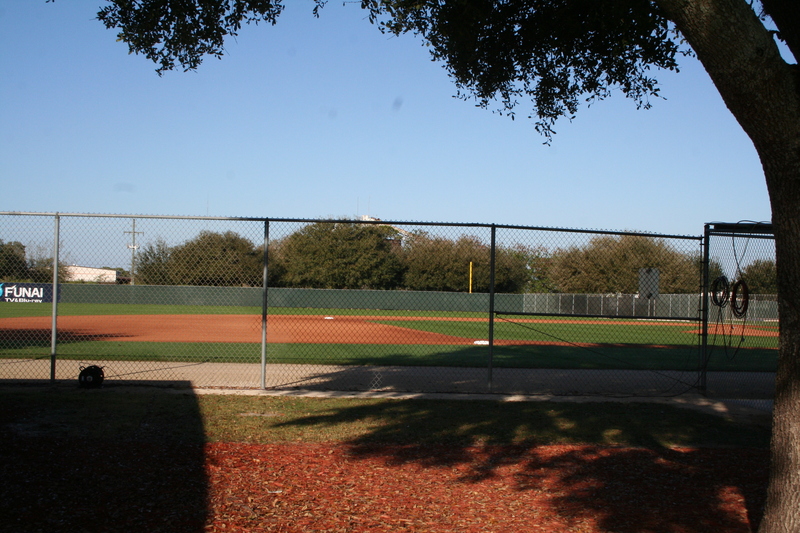 I probably won’t get up to anymore major league squad workouts, but I am very excited to start covering the minor league workouts as soon as next weekend.